Gotta love Jane Austen! Goodness knows I sure do. Those of us who appreciate this great writer of the early nineteenth century have probably read a few essays about her life or seen the various biographical movies that shed some light on her. The well-known facts are thus likely not a mystery to most of you. Maybe you are a true Austen expert who has delved into the finer minutiae of her life. Then again, maybe some of this will surprise you! Read on…..
Jane was the second daughter and seventh child out of eight total born to Reverend James Austen and his wife Cassandra Leigh Austen. Cassandra was of a higher class than her husband, thus “marrying down” if you will. By all accounts it was a happy marriage with no regrets. Cassandra’s social connections and upbringing obviously influenced Jane, giving her a ready knowledge for her novels that a typical clergyman’s daughter would not have had. Finances forced Jane to move numerous times in her life. She lived in Bath for roughly five years but hated it there, her writing nearly non-existent during that time. She also disliked London, although apparently she loved attending theatre performances and balls. Her happiest and most productive times were her younger years at Stevenage and later in Hampshire. All the Austen children were literary and talented. They wrote plays, stories, and poems primarily designed to entertain each other. 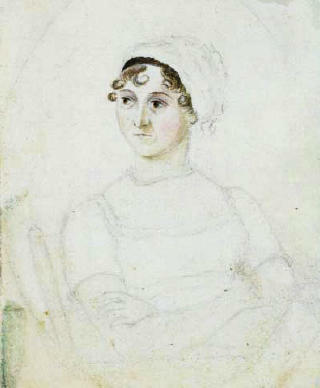 Jane was the most prolific and her early work – called her “juvenilia” – date from the time she was six years old and have been compiled into several volumes. Her first novel was begun when a mere fourteen! Jane was a bit wild, unlike Cassandra who was the sensible one. She never married but had at least three romances: Tom LeFroy, an Irishman who later became Chief Justice of Ireland and who was probably “encouraged” not to marry someone considered beneath him (see Becoming Jane); a clergyman met in Devon who died unexpectedly before able to pursue the relationship; and Harris Wither, whose proposal of marriage she accepted due to his wealth, but then broke off the following day creating a minor scandal. Only four of Jane’s six novels were published in her lifetime. All of her novels were published as written by “A Lady.” Her brother Henry added a forward to Northanger Abbey and Persuasion when published after her death revealing that she was the author of the others, yet oddly her burial stone at Winchester Cathedral does not mention that she was an author. Few knew she was a writer, although the Prince Regent was a huge fan and asked that Emma be dedicated to him, a request she could not refuse although she detested the Prince! Her books received generally favorable reviews but were not hugely popular. They were never reprinted until after 1831 and Jane only made some 700 pounds from her work in her lifetime. She would not come to be considered a great novelist until late in the nineteenth century, however, her books have never been out of print since 1833. There is only one known portrait of Jane painted in her lifetime by someone who knew her. It is a watercolor painted in 1810 by her sister Cassandra and now hangs in the National Portrait Gallery, London. Seen here and if closely examined, Jane was not particularly handsome and appears severe. Then again, perhaps Cassandra was a horrible painter! The first known appearance of the word "baseball" is in Northanger Abbey. It is named as one of Catherine Morland's favorite pastimes. The use of the term "Janeites" to describe Austen's fans dates from at least the early twentieth century. While most Austen fans today are women, early Janeites were often men. Rudyard Kipling wrote a short story called "The Janeites" about a group of World War I soldiers who were closet Austen fanatics. Jane died in 1817 at the age of 41. Her cause of death is unknown, although speculation based on current medical knowledge is that she suffered from Addison’s Disease. Was that fun? Did you learn something? I hope so! The truth is that Jane’s life is mostly shrouded in mystery. A few private letters remain since most were destroyed by her sister, and her nephew James Edward Austen-Leigh edited the ones published as A Memoir to Jane Austen in 1869 to color Jane in a softer light than her true caustic self. Her words are often humorous and wry, thus not always clear whether she was joking or what she seriously thought. Hmmm… no wonder the movies have such leeway to invent. Thankfully we have her novels untouched for us to enjoy, as I am sure numerous generations to come will do. Thanks to Misty for organizing this month tribute to Jane Austen. Any of you have fun Jane Austen facts to share? 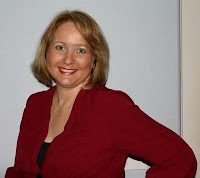 **Sharon Lathan is the author of the bestselling Darcy Saga sequel series to Pride & Prejudice published by Sourcebooks Landmark. Following the marriage and life of the Darcys, her novels currently available are Mr. and Mrs. Fitzwilliam Darcy: Two Shall Become One, Loving Mr. Darcy: Journeys Beyond Pemberley, and My Dearest Mr. Darcy. Coming in October is the fourth novel in the series, In The Arms of Mr. Darcy. In November her novella “A Darcy Christmas” will be released as part of A Darcy Christmas anthology with Amanda Grange and Carolyn Eberhart. Visit Sharon at her website: www.sharonlathan.net and also at the joint Sourcebooks authors blog: www.casablancaauthors.blogspot.com Look her up on Facebook and join the Darcy Saga fanpage! Thanks for inviting me to be a part of your extravaganza, Misty. I hope everyone enjoys learning about Jane. I never would've guessed early Janeites were often men! Thanks for the wonderful info! I have read various accounts of Jane's life and none seem too happy unfortunately and I did learn some new facts from your entertaining essay! Thank goodness her novels are such a wonderful escape for all of us and for her too most probably! I cried and cried in "Becoming Jane". To be totally honest I prefer to remember this wonderful author for her great work! It saddens me that she could not find her very own "Darcy or Knightly etc". She must have found enormous comfort in her dear sister Cassandra! I honestly didn't know much of anything about about Jane's life, so thanks for sharing! I did watch Miss Austen Regrets over the weekend and picked up a few things there.